Family Fun Weekend at the Bedford Country School, Eastern Cape. Being a Karoo traveller 200 years ago was a different kettle of fish. Said to be the oldest active cricketing trophy in South Africa, The Midland Bat has been contested in the Eastern Cape Karoo since 1891. High praise for Road Tripper Eastern Cape Karoo from the Weekend Post newspaper in Port Elizabeth, South Africa. 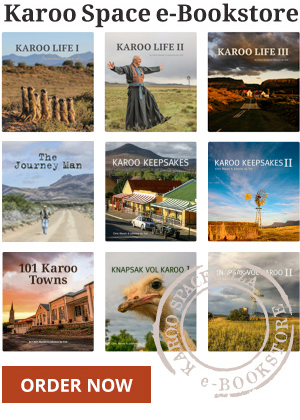 Die Tuishuise and Victoria Manor Hotel feature in Road Tripper – Eastern Cape Karoo. Startled motorists sometimes spot giant earthworms crossing Karoo roads after heavy rains. La Carla Festival Masks in the Karoo! The Karroo Theatrical Hotel outside Steytlerville sports a new array of festival masks made by La Carla Atelier near Plettenberg Bay on South Africa’s Garden Route.